It has been a while since I have talked about the fun stuff growing in my garden! 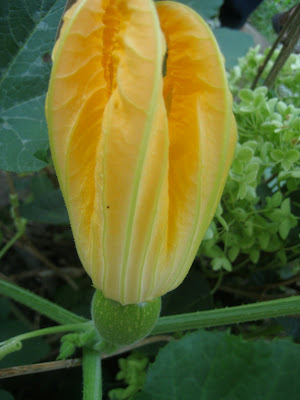 Currently, I am enamored with my pumpkin plant! Last year we purchased a pie pumpkin (smaller than the standard Jack-O-Lantern type) for carving, and before we got a chance to slice and dice it, a squirrel ate it! Well, I guess it wasn't all bad since a seed was buried by the aforementioned squirrel, and we receive a wonderful pumpkin "surprise plant!" Now there are a few things that I had to learn about pumpkin plants (I actually learned this last season with my squash plants... squash and pumpkins are in the same family!). 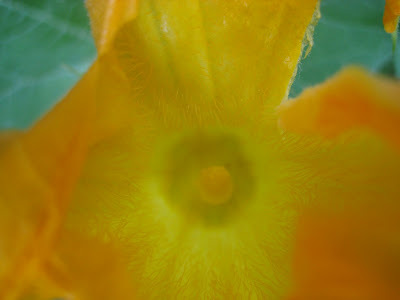 Pumpkin plants have male and female flowers, and only the female flowers can produce fruit... makes sense! 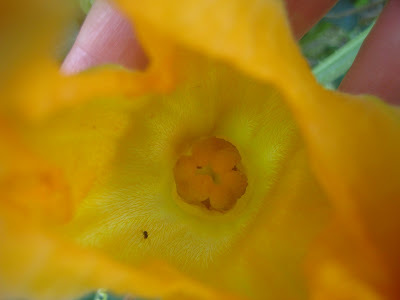 The above flower is a female pumpkin flower, and the below flower is a male flower... they NEED each other to produce pumpkins- with the help of bees and/or butterflies! Most plants will have FAR more male flowers than female flowers, which can get kind of discouraging when you really want to see and taste the fruits (literally) of your labor!!! Hang in there, and hopefully your plants will produce! When the female flower is ready to be pollinated, this is what she looks like! That bump is a baby pumpkin! Sadly, this flower didn't get pollinated, and it will not survive! This is the largest pumpkin in my patch (...wink)! I took this picture last Sunday. Five days later, this is the same pumpkin! Exciting huh? How is YOUR garden coming? Will YOU be taking a few plants for a "test drive" next season? Hi Laura! I need to blog about my garden again.It's been going crazy and we are planning on doubling the size next year. 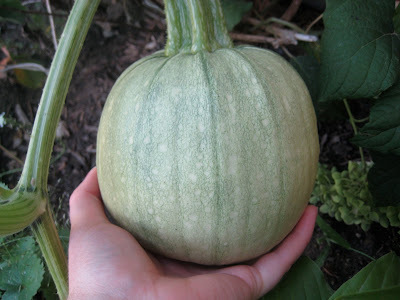 We planted a lot of pumpkins this year and we have some the size of a basketball right now. I'll blog about it soon! Some things in my garden a re great this year and some are not that great! I can't wait for you to blog... great job this year! I think this will be another no-pumpkin year for us as we have no pumpkins like you have...darn! I've taken some of the flowers off (like I've heard you're supposed to do) but I forgot all about the male-female aspect...another darn! I'm going to my garden to check it out! Another thought...does anyone keep a garden journal? I need to start doing this (with one of those extra-cheap notebooks available right now!) so I remember these kinds of things from year-to-year. Just curious...anyone? My 7 year old loves the garden idea. This is our second year and we tried plants in our pots on our patio versus flowers this year. Since the flowers were causing so many bees we couldn't eat outside anyways. But we also have a squirrel that got into our strawberry plants and will sit on the edge of the pot and eat them. After many missed strawberries that were almost ready then gone we finally got one the other day and it was so good. Wish there was something to keep the squirrel away. I have volunteer spearmint growing. Last year I bought a plant and it died. But it must have put roots down, because two very happy mint plants are growing this year. Oh. That is really a great development for a little pumpkin! I would love to plant pumpkins for my garden! 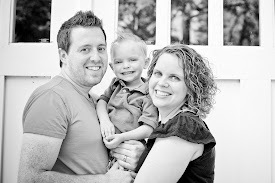 Thanks for sharing these photos. It is just like a simple but great chronological chain of events when pumpkins from flower develop to a big tasty pumpkin fruit! Now I see the big difference of a female and male pumpkin flower. I am only new in gardening and I have a pumpkin plant. Thanks for this post I really learned a lot about pumpkins.